Valentines is another short story, written by Jeannie Wong. It features two brothers by the name of Amorous and Obnoxiourous, both nephews of the god Cupid. The two siblings, tired of ruling over the Land of Love, decide to pay a visit to the Land of Heartbreak in a diplomatic attempt to unite the two kingdoms. In true fairy tale form, the two kingdoms, after much adieu, are finally able to join forces and live happily ever after. 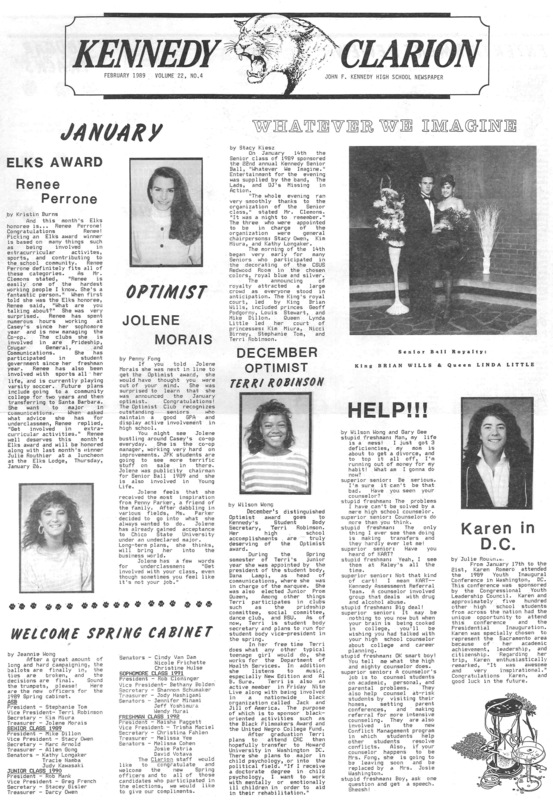 Dear PJ was an advice column in the Kennedy Clarion. The problems featured therein were much the same as the ones high schoolers experience today: crushes, match making, and, of course, the typical high school prank advice request. In the 21st century, it is rare that people know about, much less own, the antiquated VHS. Now that is so easy to stream movies or rent them via Netflix, Hulu, or Redbox, it might seem rather ridiculous that the 1989 issue of the Clarion ran an advertisement for a video cassette rental business. A 4-panel comic strip from a student guest artist showing an earlier for of senioritis at Kennedy H.S.